October 3rd, 1923. 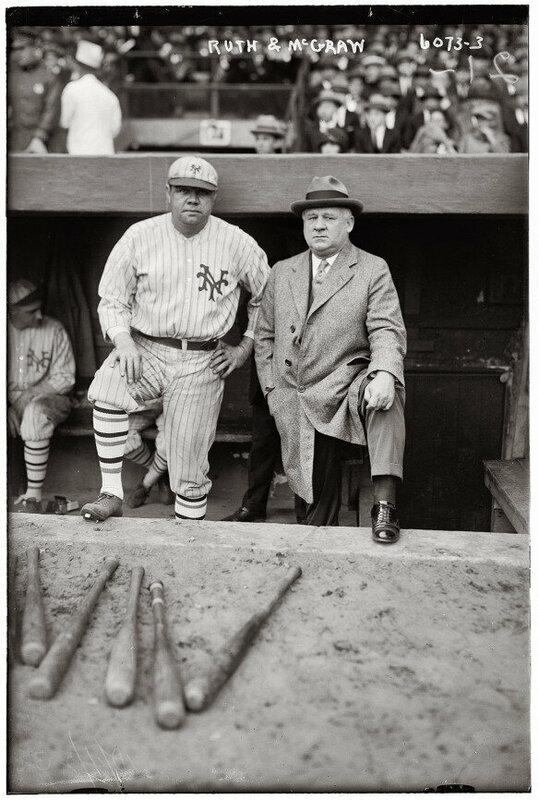 A great photo of Babe Ruth in a New York Giants uniform alongside Hall of Fame Manager John McGraw. 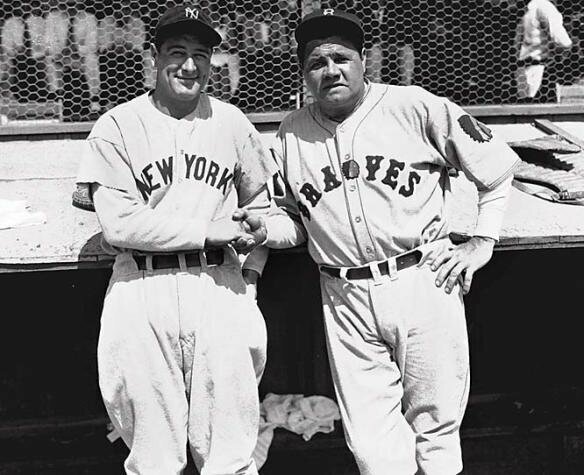 Ruth played for the Giants during the game as it was an exhibition game against the Minor League Baltimore Orioles in which the proceeds went towards a benefit. I love that. I’ve written here on Lobshots about how he ended his career with the Boston Braves. Played just one year, 1935. Must’ve been weird playing against the Yankees and Lou Gehrig. Must’ve been really weird for the people in New York to see him coaching first base for the Brooklyn Dodgers after he retired. Looks like the players loved him though. 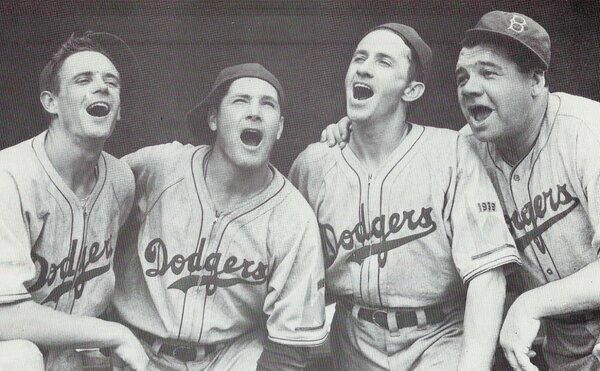 That’s Tuck Stainback, Buddy Hassett & Kiki Cuyler singing w/ him, all outfielders on the Dodgers. Notice they’ve got on zip-ups, but his was a button up. 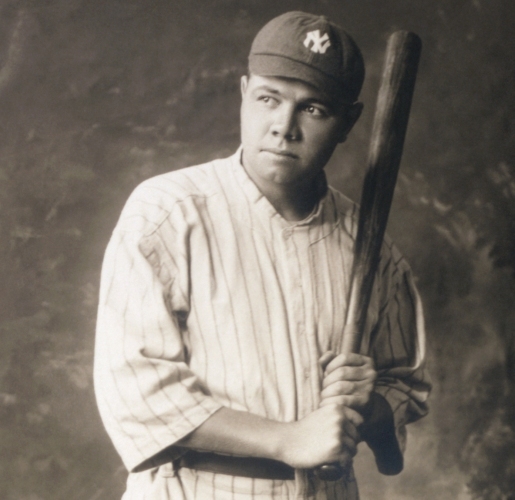 I’m guessing there’s a very, very small population of people out there that knew Babe Ruth donned the uniforms of all three New York baseball clubs (obviously this is before the Mets were around.) Pretty cool. For good measure, that’s my favorite photo of the Sultan of Swat. So badass. This entry was posted in Baseball, MLB and tagged Babe Ruth, babe ruth dodgers, babe ruth giants, babe ruth new york giants, babe ruth red sox, happy birthday babe ruth. Bookmark the permalink.